Lee’s Summit | and sure stars shining . . .
And I still remember the names of teachers, from elementary school through college, who made a huge impression along the way. I often bless them and their memory, knowing that their instruction, guidance, and example is part of what made me who I am today. Mr. Keith was my elementary school principal after we moved to Lee’s Summit in 1971. He was a good man. Rest in peace, Mr. Keith. You have earned your eternal reward. This entry was posted in Daily Life and tagged Byron Keith, Lee's Summit, Pleasant Lea Elementary on March 7, 2019 by Jeffrey Carter. Grace & Holy Trinity Cathedral chancel, bedecked for Christmas. This entry was posted in Daily Life, Episcopal Church, family, Food and tagged christmas, food, Grace & Holy Trinity Cathedral, Lee's Summit on December 26, 2018 by Jeffrey Carter. Amtrak 314, eastbound across Missouri. This entry was posted in Photography for fun, Travel 2017 and tagged Amtrak, Lee's Summit, Missouri, train on July 26, 2017 by Jeffrey Carter. I spent some time on Monday with my sister and her son Luke. He’s 16 now. This entry was posted in Daily Life and tagged family, Lee's Summit on June 7, 2017 by Jeffrey Carter. From Christmas evening in Lee’s Summit, my closest kin…. 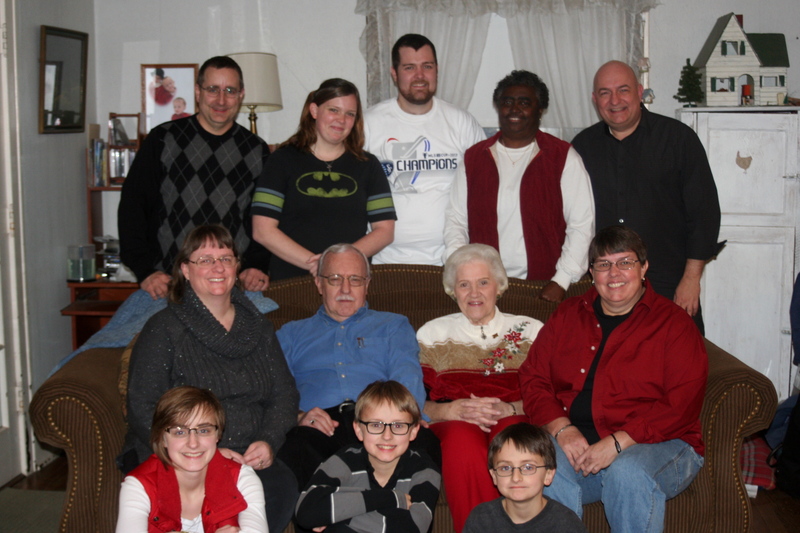 Front row (l-r): Beth’s children Anna, Luke, and Joseph; seated: Beth, Pop, Joanne, Karen; standing: Robert, Karen’s children Kristen and Blayne, Debby; me. This entry was posted in Daily Life and tagged Christmas evening, Lee's Summit on December 28, 2013 by Jeffrey Carter.